This innovative 2-axis CNC vertical lathe is ideal for machining a wide range of large, odd-shaped parts for the aerospace and construction industries. Okuma’s new V920EX one-saddle, vertical lathe features a powerful turning spindle and a larger work envelope making it ideal for cutting a wide variety of large, heavy parts. At IMTS 2016 the V920EX will be cutting a steel pump valve casing and pipe flange with Iscar tooling, a member of Partners in THINC. The V920EX boasts a work envelope with a maximum turning diameter of Ø 36.22 and 33.86” of swing over the saddle enabling it to accommodate large, odd–shaped workpieces. Highly rigid construction and powerful ball screws generate slideway movement to both axes for precise machining of heavy parts. Maximum machining productivity is achieved with a V12 turret and foolproof chip discharge. Designed for smooth chip flow, optional side or rear chip conveyors can be placed to match discharge direction based on shop floor requirements. Maintenance tasks are simplified with easy access to the air filter, hydraulic unit and coolant tank on the back of the machine. Okuma’s Thermo-Friendly Concept is standard and automatically compensates ambient temperature changes to maintain tight tolerances. Cycle times, lead times, and energy costs are significantly improved with Okuma’s open architecture OSP-P300L control and ECO suite feature. 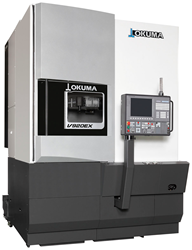 For more information on the V920EX visit http://www.okuma.com/v920ex.